These are the frequently asked questions about the A' Design Award and Competition. Please click on a question to read more. #1: When was the first time that A' Design Award and Competitions were organized? #2: How can I access to winner designs for previous years and competitions? #3: My design has won another competition, can I apply with an already awarded design? #4: Can I apply with a previously published design? #5: Can I apply for multiple categories? #6: Can I join the competition with a previously unpublished work? #7: Can I join the competition with a previously not manufactured/realized design? #12: How can I participate in a Contest? #14: How do I know when there is a New Competition? #15: I have designed a beautiful and unique product, how can I sell it? #16: Where can I find the briefs for the design competitions? #17: Can I join with multiple articles for the same design competition category? #18: I want to be informed about upcoming design competitions, what shall I do? #19: How much do I have to pay if I submit a piece of work? #20: Do I get any advantages when I win the competition? #21: I am a young designer, can I join the competition? #22: I study/work in a non-design field which means I have no professional experience as a designer, can I Join the competition? #23: Do I need to get formal design education or to be a student in a design institution to join the competition? #24: How is this competition? Do I design an object and then submit it, then the judges will judge my product/design? #25: Is this a free competition or not? #27: Is this competition for this year? #28: Is this competition open for international applicants? #29: Shall I ask new questions if I need to have subsequent elucidations? #30: I've designed a unique artifact for a project. It has no relation to any brand, it has no logotype or trademark. May I join with this design or should I make some new branding for the artifact? #32: Why can I not submit my designs in native design formats; for example Autocad Drawings (DWG) files for the architectural design competitions? or other CAD formats? #33: How much is the fee required to enter the competition? #34: How can we apply for various competitions? #35: Can we submit any kind of projects? #36: Can I apply with the same design to multiple competitions? #37: Where are the Awards? #38: How can I see the winners? #40: Do I have to pay to submit? #41: I want to participate in one of the Design Competitions and I wanted to ask what would be the appropriate date for me to participate in it? #42: Can I participate with hand drafting images? #43: Is there a discount for multiple article (design/entry) submission for the same category? For example: If I submitted two articles to the same category, does the entry fee double? #45: Can I join from a particular country? For example; Can I join from Indonesia? Can I join from Canada? Can I join from Hong Kong? etc..
#46: Can I send my design by email? #47: Is this an unlimited design competition or will I receive any requirements to follow or do I have to conform to any rules? #48: How much is the processing fee, is it per design? #49: When the submission closes? #50: I am a designer of sportswear and sports shoes, I seek an opportunity to present my designs., I am a visualization designer, I am looking for a possibility to work further on interactive visualizations., I’m a furniture designer that is seeking for a furniture company to realize my designs..etc, etc. Can you help me? #51: What is the current situation of the competitions? #53: I like to join with a post-modern, futuristic, medieval, rustic, novelty, baroque, high-tech, eclectic, organic, gothic designs etc..
#54: I am submitting an architectural project; can I submit the project file - for example the DWG file or other source files? #55: I want to submit a project of Interface Design, Interactive Design, Visualization, Sequential Design, Web Design, or other similar projects that change state over time or by interaction, how can I submit them correctly? #56: Who is the organizer of the A' Design Award and Competitions? Who runs the competitions? #57: Where do you organize the competitions? #58: I do not have a credit card, how can I make a payment? #59: I want to win this competition, what can I do? #60: Do I need to have a patented, labelled, trademarked or registered product, design or idea to participate in the competition? #61: Can I join with my patented, registered, trademarked or labelled products, designs or ideas? #63: How should I submit a product family? #64: Can I submit product variations as a single entry? #65: I do not have the sufficient funds to cover for the processing fees and payments, do you have any suggestions? #66: Can I learn more about this design competition in other languages? Can I read the design briefs in other languages? #67: I did not graduate from a design school or school of art. Can I still apply with my designs or illustrations? #68: Do the competitions repeat every year (i.e. are the competitions organized annually) ? #69: I want to take part in the competitions what do I need to do? #70: I want to do my best in this competition and achieve my goal of winning, do you have any suggestions? How can I win this competition? #72: Can we join as a team / group / partnership? #73: How to enter as a team? How can we submit a design with many partners involved? #75: As I have read on your homepage I can nominate already realized, manufactured works as well as concept stage works to the A'Design Awards. Is it right? Because I have read in the Terms and Conditions some other info. #76: Where can I see the past entries? #77: I have an innovative design for bathroom furniture/sanitary. In which category can I submit it? #79: How many files should we send for a single work, and what is the required format? #80: Do I need to send all photos / renders / sketches / views combined as a single image or shall I send all the visuals as separate images? #81: We would like to submit our works to A' Design Award and Competition, but we have an EU VAT (IVA) number, do we still need to pay taxes when we pay the processing fee for our works? #82: Is there an age limit on the competitions? #83: I am writing to you to ask if you would know anywhere where I could do my work experience? #84: In the fashion design competition, do you accept any surface pattern designs? #86: I would like to learn the postal address of A' Design Award and Competitions. #87: I am a very talented designer or arts student, currently enrolled in a university or higher education, in a design faculty or arts department, but I do not possess the very required funds for joining in the competition, is there any discounts or opportunities for students? #88: What kind of design do I need to do to apply A' Design Award and Competitions? #89: I would like to know if I can also attach a video presentation of my design in addition to the images I have already submitted. #90: I am a painter that makes geometrical and abstract artworks that I believe could be applied on textiles, I am searching for producers, what is your suggestion? #92: Can I send you my designs so that you can check it if they are good enough for the competition? #93: How can I learn more about the A' Design Award and Competition? #94: I am not so sure about which competition category to join for, can you help me? #95: Can you please give me a report of conceptual and design trends of this year? #96: Could you please let me know the amount winners are supposed to pay? In the Terms & Conditions it's called "Further Fee", however I couldn't find the amount anywhere on your website. #97: How can I check the details about the award? Could you please send information to my postal address? #98: Which products are included in the transportation and vehicle design category? #99: Is sports clothing included in the fashion design category? #100: Where I can download PDF of the Terms and Condition? Where are the Contest Rules? #101: What type of products can I submit to furniture and Homeware design Award? #102: We are a package design studio, we like to submit our designs to the package design competition, what are the different kind of products that we can submit? #104: If I want to add different designs in different categories, do I need to register multiple times? #105: How can I make a payment? #106: What kind of interiors can I submit to the Interior Design Category? #107: I would like to apply to the Interior Design competion, and would like to know what type of building will I be designing, the total area, the restrictions, and the requirements. #109: Some of the text I enter for the description of my project during uploading such as details, function, inspiration, unique properties, interaction, project duration, production technology, package dimension, tags, research abstract or challenge are not visible when I view design? #110: Are there any restrictions or best practices while entering the descriptive texts when uploading my design? #111: How can I modify or change my design description and details? #112: What kind of products can I submit to the Medical and Scientific Design Category? #113: What kind of products can I submit to the Home Appliances category? #114: Which types of files can I submit? What are the possible formats? #115: If I am submitting to Architectural and Building Design Category, how should my presentation look like? Which kind of Images should I submit? #117: How can I register to the RSS Feeds for your website? #118: Is it possible to receive newsletter from A'Design Award and Competitions? #119: Could you please summarize all the steps from registration to winning? #121: Is there any other payments after paying the processing fees? #122: I have completed another degree not related with the category that I wish to nominate my designs for, can I still join? #123: Can you summarize what type of designs can I send to each category in Italian please? #124: I am a designer and I also have a tax-code / or I also have a company. Shall I join the competition as a designer or as a design company. #125: I am not sure which category my design fits, can you help me? #126: Can I join with a product that has already won another competition? #127: I am an interior designer, can I join the competition with an industrial project into a category different from interior design? #129: I am looking to market and sell my designs, how can you help? #130: I am living outside Italy, how can I receive my award if I won? #131: I would like to send my designs, how can I do that? #132: I cannot see my design when not logged in? #133: Could you please explain further what Early, Standard and Late Application period means? #135: Where do you organize the competition? #136: What is the frequency of the design competitions held? #137: Do we need to pay any extra fees if we do not win the competition? #138: I have multiple transactions with different statuses indicated on the Relevant Transactions tab when viewing my design, is my design nominated? #139: Can I pay my nomination fee with a bank draft? #140: If we receive an invitation to join the A' Design Competition, would our entry be free of charge? If we were suggested for the A' Design Award, what does it mean? #141: What are the economical benefits of winning the A' Design Award? #142: What kinds of forms can I join the fashion and jewelry design competition category with? #143: Can I join the Fashion Design Award and Competition with a finished outfit? #144: How should I prepare the photo-shots for the Fashion Design Award and Competition category? #145: Which kind of caps and hats could I join the Fashion and Jewelery design category with? #146: If I upload a design, do I have to make any payments? If I do not nominate a design, will there be a fee for entering this contest? #147: If I do not nominate my design to any award categories, will my design be judged? #150: Does it matter to enter description of my design? What is its weight on the scoring? #151: I have received many status updates, what do they mean? #152: For the fashion design award category, do I need to send the picture of actual made garment or will sketch suffice? #153: I would like to join the Graphics and Advertising Design Competition, Identity and Branding Sub-Category, How and what should I submit? #156: Concerning the privacy and publishing settings I am not quite sure which option to go for. I have no patent for my product, yet if I should be a winner then I would be most interested in having my design published and sent to the press. If my design is seen in various media after I have filed for a patent then I would be more reassured. However, if press release takes place when no measures have been taken to obtain a patent, then this would be risky. #157: I have my brand or logo patented in my country only. If I were to show this logo in publications, would this be detrimental to the continued existence of my brand, since it will be exposed at an international level where I have no protection. Would an additional copyright covering 164 countries help ? #158: The competition category that I nominated my design was changed into another category by the jury, and I was a runner-up. Should I re-register for the next competition with the same design in the proper field or there is no need to do such? #159: I am a runner-up, will my design be included in the yearbook? #160: If I want to submit shoe design concepts, would that be under fashion or product design category? #161: I have received an email stating that I have passed the preliminaries, but do I need to nominate my submission to win, could you please explain how this works? #162: I would like to apply for the award on behalf of my company, is it possible to put in information regarding my company instead of myself for profile page? #163: How can I change or correct my personal information such as birth date, name etc? #164: How can I upload higher resolution profile images? #165: I intend to participate to the award ceremony, is it possible to have have companions? #166: My yearbook page does not display correctly, how can I fix it? #167: How can I get formal invitation letters to attend to the gala night? #169: My page title is wrong in the yearbook how can I change it? #170: I cannot change my yearbook page details or descriptions, what do I need to do? #171: Will the winners be accommodated and their travel expenses paid for joining the gala-night? #172: I would like to know if there will be official photographs taken of the award ceremony and whether those photographs will be posted online? #173: Our design studio is the winner of the design award, how many people could attend the gala night? #174: When will you send the winners package? #176: I would like to receive a copy of the award winning designs yearbook, how and where can I have it? #178: Our company would like to take part in this years competition. In order to catch the early registration deadline, may I know if we need to complete the entire submission process before the early registration deadline, or we just need to pay before that date and can still edit the submission afterwards? #180: What kind of products are appropriate for your home appliance design awards? #181: How do I use the guest tickets for the Gala Night? #182: Since I don't have a prototype of my design, I would like to know if there will be posters of the winning designs shown at the exhibition? #183: Will you sell the award book, and will the award book available to public? How Much will the award book cost? #184: Is the exhibition open to public or only upon request? What is the official opening hours of the exhibition for the public? #187: Can I place text with-in the images to better explain them? #188: Is it safe for me to submit designs that I do not yet have patents on? #189: I would like to point out that by presenting the images in the square format nearly half of the presented design content will get lost, as the content is best shown in landscape layout. Can you please suggest any solution to this issue? #190: I'm unable to order by winners kit as it already shows delivered. What should I do? #191: I'm unable to login to the website, what shall I do? #192: I would like to know if I can send my courier to pick-up both Physical Components of the Winner's Kit and the Exhibition Materials for Awarded Design. When can I send the courier? #195: We are trying to upload images for our submission. But when we upload them and submit the page just spins and spins and then says done with no progress. We cannot submit images, can you help? #196: I am unable to upload my video, how can I attach it to my design? #197: My Name is not showing up in the Designer Profile pages at A' Design Award? What am I doing wrong? #198: I just wanted to ask you wheter it's wise for me to publish my web page in my profile, since all of my designs I nominated here are present in my web page. #200: When is my design going to be locked for editing? #201: Can I submit my design in 3D Max files? or Jpeg from 3D Max? or can I submit my designs as hand sketching? #202: I have nominated my entry by paying with Wiretransfer, but it still shows as PENDING CONFIRMATION for the status, how many days does it take for my transaction to be approved? #203: My name appears wrong in the confirmation mail, will it also display incorrect in the certificates? #207: I would like to clarify the category of my works. I would like to submit some of my western calligraphy works but I have no idea that which category belongs to? #208: Do we need to make physical submissions or can we join using the online form? #210: My credit card will not be accepted when I try to pay the nomination fee? #213: My image is larger than 3600x3600 pixels, how can I submit it? #214: Can I submit a Tiff file? #215: I work with surface desing, creating patterns and illustrations for fabrics, cards, notebooks, craft stuff...In wich category should I submit my work? #216: What is Salone del Designer? #217: How do I change the name of my design or project? #218: What is the competition fee in American Dollars? How much does it cost to join the competition from Australia? How much is the competition fee in my local currency? #219: In what country is the competition centered? Where is the competition originate from? Which is the country for this design competition? #220: How is it possible to enter two persons names as joint designers of a project entry? How can I include team-members names in certificates, yearbook etc? #221: I want to submit a project, but I do not have renders can I still join? #222: Are the contents of our exhibition only the poster of our winning entry or are we allowed to exhibit other projects from our company? #223: Is it possible to change my email address? #224: I would like to check if I can pay via credit card to purchase the nomination ticket for the early-bird period now, and then submit the design work later? #225: What is a Nomination Ticket? #226: Will my award winning entry publicly visible? Can I patent it after results announced? #227: How many pieces do I exhibit at the exhibition? Can I exhibit my other designs? #228: I see the furniture design competition states that the packaging is to be part of the design. I see that the winners do not include packaging and the primary image requirements do not mention anything about packaging. Is packaging a part of the furniture design submission? #229: I have submitted a design with images, but received an email stating that there is not any images, is there anything wrong with my submission? #230: If I exit out of the entry after saving changes, will I loose all the sections I have filled out if I do not pay before logging out. #231: Is the nomination fee per image or per entry? #233: I have made changes to the pictures in the designs my designs however in while thumbnails show the right images, when I open the images in full size the old picture still opens, how can I fix this? #234: I see from the calendar that the next edition costs less, can I submit for the next edition to have a discounted entry? #235: What is the difference between submission and nomination? #236: Are the submissions without a prototype judged on equal grounds as those who have one? #237: Is there a design brief that I need to download or follow in order to enter the design competition? If so where can this be located? If there is no particular design brief am I eligible to design anything as long as it comes under the chosen category? #238: How many awards do you distribute each year? #240: How many projects can we submit to Excellence in Design Award? #241: Is it possible to register the same project to more than one category? #242: I see that my vote went down (or up) after I updated the presentation very slightly, could you explain why this happens? #243: I have ordered my winner's kit to be shipped to my address, however now I have changed my mind and I will attend the gala-night, what will happen to my kit and what will happen to the order? #244: I have a project that has won the A' Design Awards and I have a video of this project, can I exhibit the video in the exhibition? #245: Can I have an additional trophy and additional certificate for my team-members or for my company? #246: I wanted to present a couple of shoe designs and I would like to know if I should apply to fashion design or the subcategory of shoe design? #247: I wanted to inquire on what is the average time duration for the free preliminary evaluation to complete to know if our designs are adequate for nomination. #248: I am interested in applying for the design awards, am I right in thinking that there are no fees for submitting work? Also are there any fees thereafter, for example for getting shortlisted? #249: How do I nominate my design? #250: Is there any restriction that if I join the a design competition, will I be able to join other similar competitions? #252: Regarding the Fashion, Apparel and Garment Design Award, can you please tell me the details of the competition? For example, how many designs are required? Are the designs supposed to be presented in an illustration format or a photo of them as clothing already? Is there any specific theme, concept or audience for the designs? #253: Do you have any t-shirt competitions for upcoming fashion designers? #254: I do not know why I could not pay for my submission. I have successfully nominated three of my other projects. Could you please tell me if there is something wrong with the payment system or if you could suggest other ways of payment? #255: It is too difficult to submit entries to the design award, there are too many submission requirements and it is too bureaucratic to enter and nominate works. Is there an easy way to do join? #256: How can I know if my design project is good enough to win the contest? #257: If I fix the client / studio section and input my brand info, would it raise my preliminary score? #258: Do I nominate myself and my own work, or do I need to get another member to do it? #259: I find there are five (5) image slots where I can upload my designs to. Does this mean that I can nominate up to five (5) designs through a single nomination? #260: I would like to know whether Late Application makes any difference in the Award process. #261: Can freelance designers also participate in the design competition? #262: Can five (5) designers that worked on one project enter this one composition for your design contest? #263: It says on the website that each winning project have 2 tickets for the Gala Night (1 for the designer and the other for a guest or team member). Besides that, I can purchase 3 extra tickets. Since me and my partner have 2 winning projects, how many people can we invite, maximum? The maximum 3 extra tickets are per winning projects or per designers? #264: My preliminary score decreased after making improvements in design, how is this possible? Which award status will my design have? #265: For the character limit in the various descriptions for a submission, are spaces counted? #266: We have a presentation design that we would like to submit for the awards consideration, which category does it if? #267: I have uploaded my design images and have begun to fill out the application but I will need a few more days to complete populating the required fields in the application. I just wanted to check with you that the uploads and content that I have out there so far will be saved there for a few more days until I can complete the application. #268: I like to participate with a project but I am confused about nomination prices. Could you give me the price of participation? If you win an award, how much it cost when you have won it? #269: I was not able to nominate my design with the nomination tickets, the status is shown as failed or pending-confirmation. Why is my nomination ticket not accepted? #270: My design was rejected as it was identifiable what does it mean? #271: I have uploaded my entry several days ago, but I did not see or receive any updates so far for this entry, its status still seems to be new, I wanted to ask that if there is any absent info for preliminary check? #272: Our company usually uses a picture, which isn't created by us, but we have got rights to use it as we bought the image. Can we upload this image to as a part of our project presentation to A' Design Award? #273: Can we start registration today and continue next week? Does the registration process need to be done at once? Can we start now and finish later? Could we pause the registration process? Could we continue registration later? #274: I have put a substantial amount of effort into all of our submissions to boost my submission analysis scores and each submission has now gained a 99/100 score. Yet I received a low preliminary score. Could you advise what is required to get a better score then I have received. #275: After design award results announcement, could we fill in design and designer interviews and also upload further images for PR campaign or should we fill in those parts before the deadline? #276: My design got a low preliminary score therefore I do not wish to receive any information from A Design Awards in future. Also, I would like to close my account, since I had some problems on the website forms, and I am not sure whether I successfully filled all the needed data. I would be very grateful if you could tell me how to do that? #277: We did not submit anything this year. We hope to next year but we still got the participation confirmation email at the competition deadline, what is it? #278: I have updated the profile name as the Company Design Team. But we have many team members in our team. And we want to include all designers’ names on press releases. What can I do? #279: For the client, studio, brand details section: The entry is a design that was developed in university. There is not one specific client. Should I fill those blanks with the university name or should I leave them blank, since their optional? Should I put the university logo at the yearbook page? #280: Since I'm a winner of A' Design Award (Bronze) will I be invited for a Gala- Night? #282: We have not been published in any press release that you have announced. Can you please let us know in which publication has our design been included? Are their any websites where my design is featured? #283: I have a question: flights and accommodation to join the a design award gala-night, do I have to pay flight and accommodation from my personal winner? Do you pay for my travel, accommodation and leisure? #284: I checked previous and recent press appearances and I think you as an organization are doing well in spreading the news of the award and the competitions and some entries, that is all well , but in most press appearances I found only one instance where one of my projects was featured and there was no mention in any venue to my other awards (at least till now) and it is quite surprising that there are entries that show up in almost every press appearance. Part of why I entered A design award and I am sure all designers are seeking the same target is international media exposure and recognition of their work , and unfortunately I want to get more of that. Tell me what you will do about it? #285: The problem is that the title of the Prize states my name when the intellectual property belongs to another designer / team I represent? #286: I would like to know who will have the patent of designed product. will it belong to winner or your committee? #287: I'm feeling pretty let down currently, In looking at the adesignaward page toady I realize that works with much lower scores than mine are being featured, please explain. #288: What are the requirements to participate in the exhibition for spatial design projects? #289: I am not sure in which category should my project be. I would be grateful to know if it is possible to submit one design in several categories. #290: I need verifiable information of PR actions being done. Verifiable cannot be vague; I need to be able to check and verify that PR actions have been taken. #291: How to apply for the design competition; is there an application form? #292: I would like to inquire about the dress code of the gala-night. Do the women have to dress specifically in red or black? or Can I wear a navy gown or any other colour for that matter? #293: Can you tell me if I will receive a 3D Award in Gala-Night or just a paper? #294: When will be the next design competition? #296: Do you have a brief for the graphic design and communication awards? #297: Regarding the visual presentation of my design; My design is a multifunctional and dynamic product. Based on the user scenarios the surfaces and the function of the product, the unit changes. It is not possible to explain my design with a single drawing. Because of this reason ; can I prepare one of the visuals as a sheet ( putting some visuals together and animating the scenarios), and one of the visuals as a sheet which contains the dimensions and detailed drawings. Also I want to ask if I can put arrows and notes on the visuals. #298: With regards to an interior design project, what is the date of completion of the project that we could nominate to design competition? Are there any restrictions? #299: Why was my preliminary score decreased from 7 to 6 after I improved and modified all suggestions from preliminary jury? #300: My project got X points from the preliminary tests. Is there any chance to raise my design points to the 9-10 range if I consider and apply your recommendations? #301: I would like to ask if works which have already been awarded before could join this design competition? #302: I wanted to ask, how can I get a comment of a project from Preliminary Checking Service? I just uploaded a project description and images. Do I only need to wait or do I need to inform someone that I want to get a preliminary score? #303: We would like to add our product to you award competition. However, it is not entirely clear how much we would have to pay in fees for this - could you please clarify. #304: I am the PR manager of a company which does interior design and recently we did the interior design of a major hotel and I want to submit our project to A' Design Awards. I would like to know, do I have to pick a room or a lobby to submit our work or can I submit the whole hotel project with photographs of each room, lobby and outdoors. #305: Will there be one winner or five winners for a design award category? #306: I can submit everything latest by February 28 right? #307: Please let us know what are the requirement to enter for the competition, do we need to pay anything? #308: What should I do if I submitted as a digital entry but want to get a Yearbook (just Yearbook)? #309: Will the intellectual property rights of the designer be protected as a result of the submission of the design? #310: I would like to know if all the documents attached must be written in English in the design description. Can I use another language in a description document added for the design? #311: Are we obliged to credit the photogaphers by providing the names for the image credits section? #312: Can I upload different design works to participate different design competition categories with one account, how to operate? #314: Are the submissions pictorial only or do we need to submit associated text? #315: I haven't received my gala night invitation yet. Could you please inform me about the issue? #316: I have uploaded the new images. Could I expect a new voting for preliminary score? #317: I uploaded my project in order to have a preliminary judging service, but I haven't been able to get it. How can I get it? #318: Do we have to nominate each project that we upload to the system. I mean that can we decide to nominate our projects according to the preliminary checks? #319: What I should do to take a part in the design competition? #320: We have just updated all the text fields with better descriptions. However, after we've done that, the preliminary score we received earlier, seems to have disappeared. Is there a particular reason for that? Moreover, is it possible to get a new preliminary score (besides the professional preliminary evaluation) ? #322: Can I send the design presentation as a drawing on paper? #325: After nominating our works do we have to do anything else or we are just waiting for the results? #326: Can we know the final fee before nominating each work? #327: Are we obligated to pay the fees after we see the final price by uploading our work and receiving a preliminary score but decide not to participate? #328: Is it recommended to include plans, sections and design schemes as optional images? Or we can only use them in the documentation ? #329: If I pay the nomination fee with my own currency, will it be automatically converted to my currency? Will there be additional costs? #330: The preliminary check was not as accurate as I expected, I am an important designer and I deserve to know more about my work. #331: Honestly I can't settle with the preliminary score that was given already by the jury member. #332: If I do not complete any nomination will that mean my project will not be a part of this design competition? #333: I am planning to nominate the same design to multiple categories by making two nominations, how should I prepare the presentation? Can I use the same presentation for both? #335: At the end of the competition, I would like to ask you about preliminary score, it decreased the last day, can you please increase it? #336: My design excellence certificate displays the wrong name. #339: Is there a possibility to submit three different models of the same design in one only ID#. How do you recommend me to do it? Is there a possibility to still submit three main images and four optional images for each of them? Other ways I would only submit one because the optional ones are important to understand the object. Can i submit as well one sketch drawing in each group? #340: I have submitted my design. But I haven't got a patent yet. Is it safe (my design will not be stolen) if I submit my design? If there is a risk for me losing the patent of my design, I might think again before joining the competition? 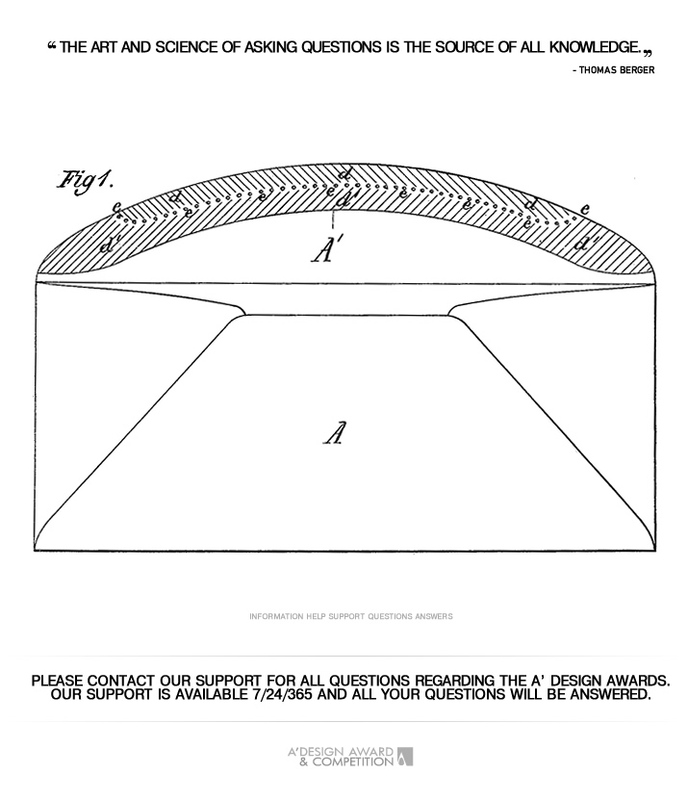 #341: Can I join the design award competition without a patent? #342: Is it possible to participate in 2 or 3 different categories as a designer? #343: Does the product have to be mass-produced? Is one piece only produced designs eligible? #344: I want to use the design mediation services to sell my design and I already made international patent filing for it for that purpose but I do not know how to set the price for my design? #346: Why the nomination fees differentiate based on entry period. #347: Would you tell me what are the differences between all the types of nominations? Will that affect the evaluation, or is about something else? #348: Could you provide a little bit information about the award, the history, the number of participants (and from how many countries) and the number of selected projects? #349: Who are the participants of the design award? Are they design students, professional designers or design studios and corporations? #350: Who are the jury, and a little description about how professional are they? #351: Where the selected designs are going to be displayed? Which cities? #352: What is the reputation of this competition? Why it is so prestigious and famous? #353: What is the benefit of being selected in this competition? #354: What is the competition criteria? #355: I do not know in which space I shall put my logo to go together with my design award entry? #356: Will we get a certificate of participation or award? #359: If I register but change my mind about submitting my work, am I still liable to pay fees? #358: What kind of design can I submit to the design competition? #360: If we choose to get a preliminary evaluation for our design by uploading or work, is it obligatory to nominate the projects later or can we decide and pay the nomination after known the score? #361: If the design has been awarded in other competition, can I still submit the work? #362: I designed the product for a company and the first question is about the use of its logo. Do you need any special document from the company to upload the logo in the entry form? Or could be a document for my use of it? #363: I have uploaded my design, how should I apply for Free Preliminary Check? #364: To enter the fashion design part of the competition, do you want completed garments now or is it preliminary designs and complete the garments at a later stage? Also for the entry do you want or need a process of design - as in where the concept of the garment came from? #365: Is it possible to proceed with an entry and win an award without going through the nomination stage? #366: I would like to know if the nomination procedure is compulsory for each design entry? #367: We designed a building and we did both interior design and architecture, which category shall we join? #368: If someone's submitted design gets selected in the A' Design Award then he/she has to make that design in Actual form immediately? If yes, how much time is provided for that ? #369: Do designers get some financial support from the A' Design Award to develop the selected designs? #371: I received an email from A' Design Award that I won some money, and I am supposed to send my name, surname, bank account details to you? #372: Why there should be any design awards? What is the purpose of design awards? #374: I would like to know if I can upload more than one project. #375: After awards announcement, I notice my presentation score changed, it went to 98 from 100, how come! #376: If we apply a project as a group of two (2) people, in this case which is the fee due for nomination? #377: I have had a read through your guidelines and will be applying for the preliminary stage very soon - just one thing, I see no mention or address for submitting on actual product, prototype or sample. Is a product or prototype submission required? #378: Which is the next stop if our design has passed the preliminary test? Do I have to nominate my design, how can i do it? which is the deadline? #381: I have already registered my entry but I need to know that do I have to pay any money for the first judgment or not? How many times our entry would be judged? #383: I got different preliminary scores on different dates with different account types, there was one point difference. Has the account type any effect on our score? #384: We will not nominate our design due to the negative feedback of the preliminary test but are we obliged to nominate our design or can we participate with another project? #385: Is this design competition can be join by a group? #386: I thought, I could take part at the promo. I compared the ticket-prices and I am lost. With promo it is X Euro, normal price is also X Euro what am I missing? I have a preliminary score of 9 and would like to buy a pro nomination ticket. #387: How much time I have to put on or insert drawings? #389: I noticed there are nominations...This is a concern because if it is dependent on how popular- how many likes you get from public - how can a single person compete against large design firms who can draw on a good response from great audiences? #391: I would like to ask about registration fees since it is not very clear to me. If I understand it correctly, we can submit our products for free and pay after preliminary checking if the results are good, right? #392: When should we decide which type of nomination do we want, before the submission or after the preliminary checking? #395: Will I have a proof of creation document if I win the design prize? #396: Can I submit my design into many categories? If yes how do I do that? #397: Can we submit our products free and decide on nomination after the preliminary score? #399: I have renders, sketches and photos of my design as well as the design itself, which should I send to you? #400: Can I send teamwork projects? I mean designs I did with another person? #401: I would like to confirm if all the images have to be in square format? #402: I have submitted my work and now I have a preliminary score. I would like to know when I have to finish nomination of my project in order to have my work considered for the design award. #403: How much does the registration cost for a designer who has designed a product for a company, and that product is already in the market. #404: What is the runner up Award? After winning the runner up, can I get some rewards? Such as certificate or a badge? What are the rewards for runner-ups? #406: A product, to be submitted, needs to be produced by a company or not? For example can I submit a table only by a render image? Or submitting a prototype photo? #409: I live in an another country, I am not sure if I could attend or bring my item to exhibition. #410: What is the nominal fee incurred for winning a prize? #412: About the possibility to participate as co-author (we are two designers that need to present one project) but I need to know if we must register separately or not. What are the correct steps? #413: Do I still remain the sole owner of the copyright to my works, if I nominate my work to the competition? #414: My friend has not gotten any preliminary score, there is a question mark in her page, how she can get preliminary score? #415: I have updated the details of the entry as well as images, but my preliminary score remained the same. Is that because there are no more evaluations before the deadline? I am too late for a preliminary score? #416: Hello! I am new in design competitions and I would like to know why I have to pay so much money in order to participate in the competition. Thanks! #417: In the "personal profile" page, there are several fields to be completed, will this information appear in the publications or only in the website? #419: I would like to ask your images format is RGB or CMYK? Which color format shall I use for the documents and images? #420: Could you please tell me if a work wins the design award who will receive the winner package? The profile owner or the Company that commissioned the work? #421: Do I have to increase all luminosity values for images to 100? #422: How can I know if I am a winner and got the award? #423: How come my entry is not a Platinum award winner even though it is the first in my category! #424: Why there are so many winners? #425: I had a refund for a wrong payment, how long does Credit Card refund take, how many days do I wait? #426: I got a notification regarding fees due to wrong account type usage, what is this all about? My account type is Professional. #428: My work received participant status, can I join next year or for future editions with this design? #429: My design incorporates some third party elements, does this violate any terms and conditions? #430: Could you please clarify if our design is rewarded with the Gold or the Silver award? We were informed that the design achieved the Silver award initially, yet we right now found that the gala night badge saying we won the Gold award. In fact a list of the stage name in the following page also classify us as gold award winner. Could you please help check it for us? #431: I have just become aware of your awards and wish to enter - most likely in a specialized category. Am I correct in saying the next time this will be awarded is in next year? #432: If I nominate a design can I still edit it? #433: I do not see my picture or photograph at the Photo Gallery - Winners' Photos and Images Section, will my photo be added there? #434: I am a new designer, working alone at home. May I participate to the Design Competition? I do not own a Company. #435: I am a winner but my design is not in the book, there is no poster in exhibition and it is not displayed online, why is that? #436: I've asked to change the shipping address for my design award parcel several times by sending support some emails but I just got an email saying it's shipped to my old address. Is there any chance to change the address now. Please let me know as soon as possible. #437: I am a fashion designer with no company and I would like to apply in a design award and competition how can I apply? and how to do it step by step? #438: How the criteria for classification and position of each design ranking is defined? Only the points of the award are considered? #439: What is the difference between DAC - Design Classifications and World Design Rankings? #440: I need the invoice for paying for nominating my design for my account department. How can I receive it? Can I have a proforma invoice? #441: I had nominated my design and got a Preliminary Evaluation and score. As your suggestion, I am working on editing my design and updates, can I still get a Preliminary Evaluation again with free of charge? #442: I recently nominated my design so that I could take advantage of the early nomination fee. I am now a little worried as my submission needs a lot of work and I will be unable to make it perfect for the next few months as my photographer is away. How long do I have to make the required changes to my design please?. As I would like to make it perfect before final judgement. Also will my submission compromised as I nominated the design too early or is it only fully judged at a later date? #444: For Architectural submissions, I understand right, the designs can be in manual sketches, renderings, blue-prints, in this case do they have to have planning approvals received? #445: When submitting an entry there is no sub-category suggestion, how do we choose sub-category of the design? #446: Please advice if both built (realised) and conceptual projects would be judged within the same design award sub-category or category. #447: Client Logo is optional in the guideline but it seems it it is required in the online submission form. #448: For the main and optional images, please advise if composited image is accepted? #449: Do I need to upload Design Interview and Designer Interview when making a submission? Do these refer to designer profile? #450: If the winner design is in a concealed category, will these works be displayed in the award ceremony in the screen or stage? #451: I got an email about exhibition shipment custom duty fees, what is this about! Is not the exhibition is free? #452: I would like to ask if the nomination fee is assigned for several projects by participants or for one selected project? #453: Is there any fee for submitting our concept designs and nominating our design concepts for competition? #454: I am a team member to a project, my name is written wrong on the credits, can you update? #455: Can we participate in the contest with the layout of the magazine? #456: I have an award winning work, will the design award cover the cost of my international patent application? #457: My profile image is not displayed with the rest of the award winning designers, why is that? #459: I have noticed that the shipping address of the Winner's Kit is not correct, can you use the correct address as shown on our profile? Can you send to a different address? #460: The name on my certificate is wrong, it is my name not the company name, how do you fix this? #462: I have uploaded my designs in my hidden cabinet, and I would like to use Preliminary check before nomination. How could i activate this service? #463: Where can I download an invoice? #464: We are an advertising and public relations agency, we wish to nominate a product from one of our top clients, what do we need to and which account type do we choose. #465: I have not received my award, winner kit and everything else and it's been a long time since the Awards ceremony, how can I have them? #466: I didn't get a confirmation email after registration and couldn't further proceed what should be done? #467: What is the New Account Type? What is the account type New? What are the benefits of New-Type Account? #468: How do I earn DDP points? #469: Why do I have to pay Value Added Tax? #470: I have submitted my designs but did not get scores, did I forgot anything? #471: ​I registered for digital edition and do not know anything about conceal categories but I think I have chosen a concealed category. Are all the digital categories are concealed; i.e. did I make a mistake? How can I change my design to be public? #472: My team members' names are not being promoted enough while my name is everywhere. #473: We would like to know if English or Italian will be spoken in the ceremony and Gala Night, also, please kindly advise if you offer translation service during gala night ? #474: I have recently came across the award winning design page, I was a team member of this project but my name is not there, can you add it? #475: We didn't go to the awards this year and we have not received any items from you, how can we have our winner kits? #476: My better design got a worse preliminary score than my other design, why is that and how does it happen? #478: I won a Platinum award but my trophy is Golden, why is that? #479: Can I come and visit your office to discuss my participation? #480: We really wish to join as a company, unfortunately we don’t have marketing budget available to submit. #481: I have a nomination ticket that I haven’t used and when I go through the steps to pay and use the nominated ticket there is still a fee shown, how can that be? #482: May I purchase the entry now, but submit my work later? Do I need to firstly do the Preliminary Score Test ? When can I use the ticket last? #483: We are honoured to receive the awards from A'Design Award, however, we did not receive any certificates and packages, how do we get our stuff? #485: Would I be submitting a specific piece or would I be submitting multiple pieces that together would exemplify a certain style or technique of art? #486: We would like to know whether physical copies should be sent? #487: I cannot remove images for my design! How can I remove an image of my submission? #488: Do Platinum and Golden Winners get bigger exhibition space? #489: Why can’t I modify my participation to Gala Night after the Preliminary Gala Checklist Deadline? #490: What are Judging and Dissemination Preferences and how do I change them? #491: I had submitted my Jury application earlier, and wonder when will I know the jury application result? Please let me know if you have any questions or if there is additional process. #492: I did not get a preliminary score and my entry was rejected! WHY! #493: I need to send an item back, what do I write as its value? #494: For the Photography Awards; I have just a single good photo, but you need us to provide multiple images, what do I do? #495: We do not have a Logo, what do we put to the Logo section of the entry? Can we just leave it blank? #496: Our preliminary score is low can you increase it? We think if you increase our preliminary score, the grand design award jury might give us a higher evaluation? #497: You said no further fees and I was just charged a ridiculous amount for using my brand name! I am representing a very large international company! What is the meaning of this! What does wrong account type even mean! #498: What do you mean you have cancelled my winner kit shipment after I open a payment dispute right after results announcement? Why did I also get negative credits for that? #499: I am a professional edition winner, do I need to pay for the delivery and shipment of my winner kit to my address using an express courier? Am I obliged to order the winner kit? #500: My Design Hero image displays incomplete or wrong name for my design agency or company. #501: I paid for express judging service but after so many days, my entry is still not evaluated, what's wrong? #502: I send my package to your exhibition in another country, I got confirmation before I sent package that you would exhibit my work, but no one picked my package from the post office in the destination country, how do I get compensated? #503: I am unable to login to my account. I am pretty sure my password is correct and my account is not deleted or removed. The login simply does not work; I am being redirected to login page again. #504: For the very same design, with the very same images, and within the very same competition category, I got totally two different preliminary scores when I submitted from different accounts. How and why this happen? #505: Will I be invited to the Gala Night? #506: I want to bring a couple of very important people, VIP contacts, such as ambassadors to Gala Night, is it possible? #507: Did you delete my nominated design? If you did not find your answer or question, please feel free to contact us or alternatively talk with us.